Ask fellow campers about "Crazy Horse RV Campground" and nearby attractions. Question: The campground website, accessed via the button on the RV Park Reviews page goes to a FB page that has nothing on it. I can't seem to find a website with the regular information I would expect to find about the park. Any clues? Answer: I was never able to find any website on this campground either. I just took a chance on staying there, and it was not bad. 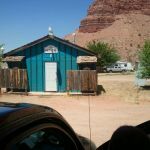 The cost was comparable to the other campground in Kanab. Just call them if you have any questions. Easy access off of the main road through town. Gravel roads with plenty of room for our 40' 5th wheel. We paid extra for the 50 amp hookup. Lots of tress of various sizes do provide some shade. Quiet park even though it was close to the main road. Staff was helpful and helped us find our spot which was fairly level and made it easy to level camper. Power, water pressure, and Verizon signal excellent. Their WI-FI worked well. We camped at Crazy Horse RV Campground in a Fifth Wheel. This park was a good price, but the amenities were spotty. A bit run down, but fine for a night or two. We camped at Crazy Horse RV Campground in a Motorhome. Old and dilapidated park with utilities in various states of repair. However, good location, not a bad value, fairly clean and quiet, and the customer service was excellent. Back side of park is very run down full time trailer park - looked like the set of Sanford and Son. Wifi was excellent, good selection of o/a TV stations, Verizon signal strong. Shared utility posts. Stay away from site #73. Most sites have a little grassy area at the front door, but not this site. There is supposedly space there for a patio area, but it is not distinguished from the roads going by, and the locals drive right over it all the time. Did not feel safe putting my awning out for this reason. We camped at Crazy Horse RV Campground in a Motorhome. We had a relatively bad site. Some were better, but they shared the same very poor shower/restroom facilities. The power plug at our site had been hit by a vehicle and bent down. Difficult to hookup and possibly unsafe. There was a chair and table at the site, but so wobbly and broken down that it was unusable to sit at. The bathrooms were poor. Worn out and not clean. Showers did not have adequate changing space and you had to step into the entry way to change in front of everyone coming/going to the toilets or lock the whole place down, so the cost was $34 for electric and water and minimum restroom. Water and power were adequate at the site. In summary: Okay in a pinch, but there is a much better place in town. We camped at Crazy Horse RV Campground in a Truck Camper. Lots of great things to do nearby and that is why this place can charge $35 for a partial hookup. Nice FHU sites with good electric and water quality; Offered WiFi; TV Antenna reception good; pool; small rec area but the billiard tables covers were both torn. Laundry facilities not very good. There are some full time residents but good enough for a few days. Have a few tent sites. There is a dirt road off to the east which connects to a subdivision with access to the Kanab Rim Trail, which was fantastic to walk and let the dogs run loose. We camped at Crazy Horse RV Campground in a Travel Trailer. Lots to do in the area. We drove to Paria Mtns (5 miles up a dirt road), which is part of the Grand Staircase Escalante NM; also the North Rim of Grand Canyon. Best Friends Animal Sanctuary is in Kanab. The price includes $5.00 for 50 amp service. We were here for one night on the way to Lake Powell. Site was sloped, requiring leveling, and I added a portable entry step which we carry. The pool was clean but cool. Laundry was $1.00 to wash, and dry. There's a rec room with 2 pool tables. The free wifi worked well. Staff provided a brochure (one of the best we've seen) with area facilities and vacation info. We would consider staying here again. We camped at Crazy Horse RV Campground in a Motorhome. There's many things to do & see in this area. It is a short walk to town, and easy to find a fuel station with decent prices. I don't know what the other reviewers expect but we thought this was a nice place to stay. Staff were very friendly. We don't use the restrooms or showers. I thought that was why you travel in a rv and not a tent. Yes, the lot was not level but judging by the terrain I don't know what you could do that wouldn't be undone every time it rained. We didn't use the wifi either. Nice treed park. Very clean and quiet. We camped at Crazy Horse RV Campground in a Motorhome. Beautiful area, plan to be here a while. This park is everything the other reviews have said. The roads and sites are gravel with grass and dirt. There are some flat sites but we used 4.5" of wood plus full extension of our air bags. They have 50 amp for $39/ night but we had the 30 amp. with water and sewer at the sites. The park is pretty quiet with about half the spaces taken by long term residents. We were here in 2013 and the bathroom/showers were clean but showed their age. Since then they have retiled the bathroom but the showers are still a bit old but functional. They have great pressure and all the hot water you can use in the showers. When the hot water heater kicks in it sounds like a couple of souped up Harley's idling out side the door. This is the rv park that will probably have room when the other one is full. They do have a pool but it has not been filled yet and I'm told that it is open during the summer. We will probably stay here again when we are in the area. We camped at Crazy Horse RV Campground in a Motorhome. Lots of outstanding hiking in the area besides "The Wave". The folks up at the BLM visitors center are very helpful. Also go visit "Best Friends" no kill animal shelter. These are a bunch of fine folks taking care of animals and doing it right. There are a multitude of restaurants with the "Rocking V" on the top of the heap as far as price and food goes. It is also the only full bar in town. This place is between BAD and TERRIBLE. The campground is run down and was designed for a 14 foot travel trailer. The sites are not level and most motor homes are on blocks with a ladder up to the door. The electric looks like 1950 wiring that has been modified by a farmer. Power was unstable and 50 amp pedestal looks like an old 30 AMP 110v that was converted to 220V. May still only have 30 amps. It does not look safe. The bathrooms are rotted and dirty, and today there was raw sewage running through the campground with a plumber out there trying to get it under control. There is an ABSOLUTELY NO REFUND policy in force here. There is a very good reason for that policy. After they have your money and you see how terrible this place is, you will want to leave. You can leave, but your money stays, and they will re-rent your site after you are gone. If you ignore this review and stay here anyway, my advice is to just pay for one night and then if you want to stay, you can pay for more. By the way, I am writing this review using my ATT hotspot because for the tenth day the WiFi is not working. Why did I stay for ten days? NO REFUNDS. We camped at Crazy Horse RV Campground in a Motorhome. This is a barely adequate park for a stay in a beautiful area of Utah. The park is poorly maintained. The roads are rough, the hookups are antiquated. For example the sewer openings are covered with stones; the 30 amp hookups consisted of two legs hod hot wires from a 50 amp hookup. One leg for each side-to-side head-to-tail parked camper. If you turned of electric on one camper, you turned off electric to both campers. On the plus side, the Wi-Fi service was superb - fast and easy, totally accessible. 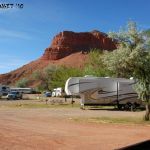 We would probably stay here again, as good RV Parks are difficult to come by in the Kanab area. With a little effort this park could upgrade itself to being more than barely adequate. We camped at Crazy Horse RV Campground in a Motorhome. Even though we reserved our week here, they put us in a "Pull-in" site that required 32 feet of sewer hose and 25 feet of power cable. The place worked for what we needed, but the inconvenience wasn't necessary. Oh, with all the scenery here, our view was the business next door. WiFi was good as was 30AMP. We camped at Crazy Horse RV Campground in a Motorhome. The campground needs a little love. Shabby is a good description. Two of us in separate RVs were here. My friend couldn't get her rig in the reserved spot because of a tree, so she was moved to another that was so unlevel that the rear axle of her rig was off the ground. When I arrived, the put me near her, not next to her as requested. Wifi was good. Permanent residents were a bit sketchy. The sour note for us was after we had been there four nights, we wanted to extend our stay so we could enjoy the area longer. I asked if we could add three more nights and get the weekly rate and was told no. I understand it was perfectly in their right to not offer a deal, but in the interest of customer service, it would have been nice. The park only had half a dozen sites occupied, and I'm sure they'd rather have sites used at a reduced rate rather than leave them empty. We left for another park up the road when our four nights were up. We camped at Crazy Horse RV Campground in a Motorhome. The manager is friendly and check in was easy. Our space was fairly level but somewhat cramped. We had no neighbors on one side, although someone pulled in one afternoon, apparently planning to camp there, but decided it was not a good fit. Thank goodness because it was a large fifth wheel with slide-outs on both sides, resulting in really a behemoth of a trailer that had no business trying to fit into such a space. It would have been inches from our rig. One long-term tenant has two chihuahua-type dogs, which he lets out to potty whenever he feels like it. The rules say pets must be on leash and he is only a couple of spaces from the manager, so it appears this is allowed. When we were outside, the dogs would run over and bark and growl at us. Not to mention pooping wherever they felt the urge. If you don't see them poop, you don't have to clean up after them, right? The restroom/shower facilities are quite old, but it appears there is an effort to keep them clean. We did not use the showers, partly because I heard someone in the shower shriek when I flushed the toilet. Yikes! The wi-fi is extremely slow and I gave up on using it. Many antenna stations available on the tv. There was not much adverse weather during our stay, so the site did not get muddy. We camped at Crazy Horse RV Campground in a Motorhome. There are several restaurants within walking distance. Drug stores, hardware/feed and grocery stores close by, too. We liked the view of the cemetery out our back window. We did NOT like the long term campers that smoked outside our trailer, or the arguments at 11 pm outside, or the slamming doors at 10:30 pm, or the barking dogs on both sides. We left ASAP the next day. We would never stay here again, or any place like it. We camped at Crazy Horse RV Campground in a Fifth Wheel. Very close to Best Friends Animal Sanctuary and Zion National Park. Four or five good rock/fossil shops nearby. A grocery store and gas station are within walking distance. Are you affiliated with Crazy Horse RV Campground ?